You'll choose None if you're cool like us. It sure is great to be able to see the first few lines of emails as they come in on the iPhone, but it’s equally helpful to see more subject headers on the screen at one time. The more emails I can see at once, the more I can ignore, focusing more closely on emails that look promising. iOS allows you to change the number of emails up on the screen at one time with a simple trip to the Settings app on your iPhone and iPod touch. It’ll even work on your iPad, but that may not be as important as it is on a much smaller screen. 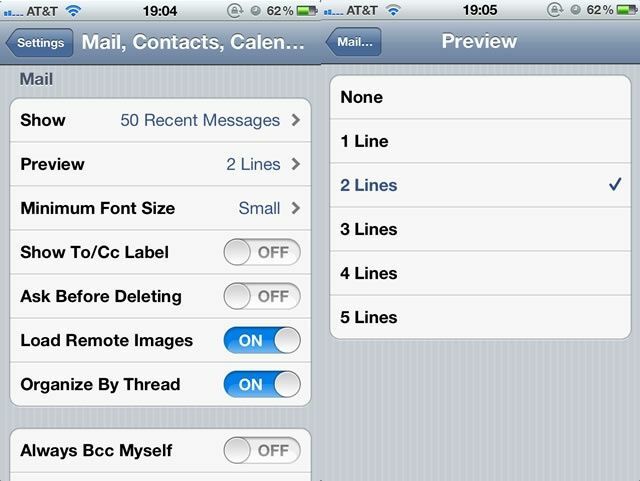 Launch the Settings app on your iPhone or iPod touch and tap on the Mail, Contacts, Calendars item. Scroll down to the Mail preference section and tap on the Preview item. This will show you the options for how many lines of the email body to show on the Mail screen. Tap on 1 Line, or – better yet – None. This will give you the best use of your Mail screen, as you’ll see more of the emails, rather than more of the individual email bodies. You’ll also get the added benefit of being able to delete more emails without a scroll when in edit mode, and you know that’s a win. Conversely, if you really want to see more of what the email says, and don’t mind scrolling a lot more, tap on 5 Lines to get more preview, less emails on a single screen of your iPhone or iPod touch.